North west roof moss north view. Almost all homes in the North west have a north facing side on there roof. A roof angled north gets less sun, keeping the roof damper longer promoting the growth of moss. You know that saying “You can always find North walking in the forest by looking for moss” Very true…lol. Next time driving or walking up the street, look at peoples roofs and orientate your self north! There you will never get lost again! A benefit of roof moss. Heres a moss removal project were tackling next week. 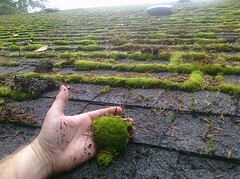 As you can see from the picture the moss appears to want to peal away from the roof fairly easily. You always want to do this test to make sure the roofing is still in fair to good condition. If the roof is in poor condition the best practice would be to spray and treat the roof with a moss killer, then return on a later date after the moss is dead to clean up. Get yours cleaned today – Click here! ROOF CLEANING | GUTTER CLEANING | PRESSURE WASHING – FREE ONSITE QUOTE TODAY! “I truely have some of the best employee’s” This project was done by Ben Peters. * More Weight is given to a report where work has been completed. I had the gutters on our two-story home cleaned out and had all of the windows washed inside and out. The folks at Gleaming The View were very friendly and professional, from the person who booked the appointment through the gentleman who performed the work. On the day of the appointment, they called ahead to let me know they would be ten minutes late – which I loved. The gentleman who was here was very meticulous in his work and did a thorough job. Even though it was raining extremely hard during some moments while he was cleaning our gutters and washing the exteriors of the windows, he was a happy camper all the way until the end. I would definitely use this company again and recommend them to anyone in need of their services. They are a stellar example of what customer service should be. What surprises came up during the course of the work? None really, just took them a couple hours more than originally estimated, but it was no big deal. What words of advice would you give other members considering this contractor? Use them! They are the best! What words of advice would you give this contractor? Thank you for being a shining example of what a contractor is supposed to be. Live in Tree City USA? Call for a free quote. Tim Hunter / Gleaming the View Inc.
window cleaning, roof cleaning, gutter cleaning, pressure washing in Beaverton Oregon High quality cleaning services with affordable prices.